The Mareda apple was first grown in 1926 by A.C. Nash of Scutes Farm near Hastings, from a pip of the American apple Winesap. It is currently cultivated as part of Brighton Permaculture Trust’s National Collection in Stanmer Park, Brighton. You can see a Mareda apple tree (planted 2010) in Home Farm Orchard, Stanmer Park ( map). 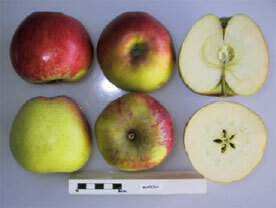 Mareda is a large apple that is oblong-conical in shape. It has a distinctive sweet, winey or sweet melon taste, with firm flesh. It is handsomely flushed orange-red, and striped in bright red over yellow green. The fruit can be picked in late October and stored until March. The variety grows vigorously with biennial cropping.